Furthermore, it can also be used for Android development, just like any other normal Android board. Loader.zip:Pls feel free to email us to get it if you need. This is a universal driver board for e-Paper raw panels, thanks to the WiFi connectivity, it is allowed to display image from PC/smart phone via WiFi conveniently.Furthermore, it can also be used for Android development, just like any other normal Android board. 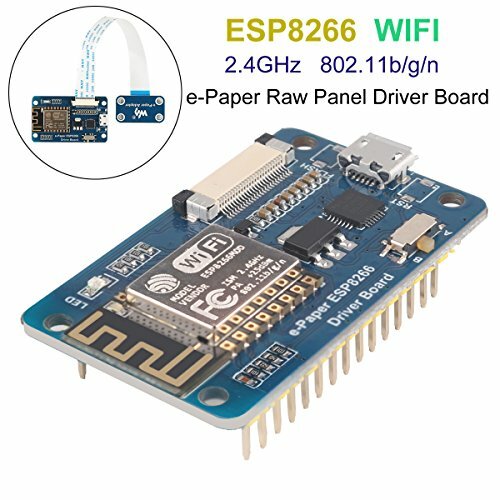 Onboard ESP8266, supports Arduino development. WiFi Protocol:802.11b/g/n，Operating Voltage: 5V ，Operating Current:50mA 100mA ，3-wire SPI, 4-Wire SPI Interface. Provides HTML host code，Supports Floyd-Steinberg dithering algorithm, more color combinations, better shadow rendering for the original image，Supports popular image formats: BMP, JPEG, GIF, PNG, etc，Easy to be integrated into wireless applications. If you have any questions about this product by MakerHawk, contact us by completing and submitting the form below. If you are looking for a specif part number, please include it with your message.